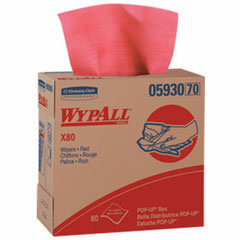 WYPALL* X80 Wipers in our Pop-up* Box format and red color. X80 wipers are the wiper of choice for your toughest jobs. Heavy industrial tasks, cleaning grease, grime and oil, solvent wiping, cleaning rough surfaces, or any other challenging task are where our X80 wipers play best.